The Silva Trail Speed Elite is a multi-purpose head torch designed for use in a range of sports from hiking/running, skiing or cycling. 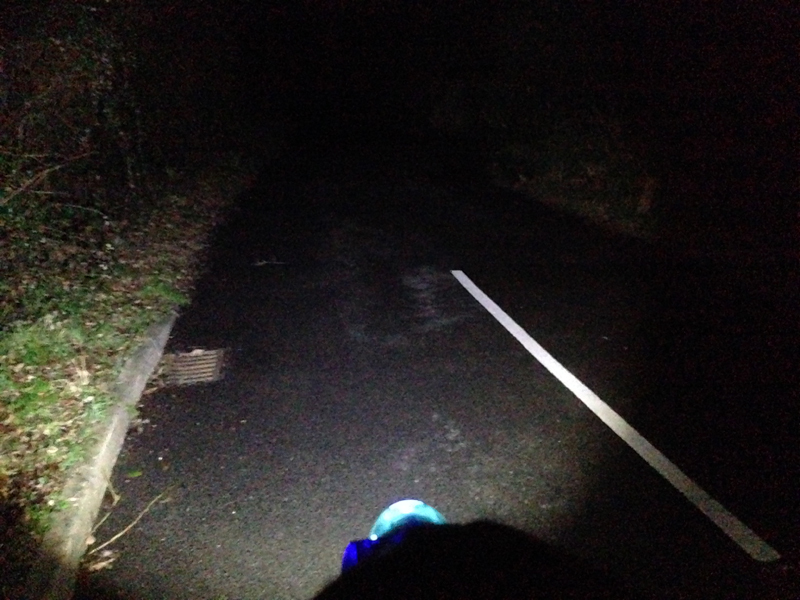 The headtorch itself is very small and lightweight and the package comes with a range of attachments which enables the user to mount the headlamp, on a helmet or the handlebars of a bike. 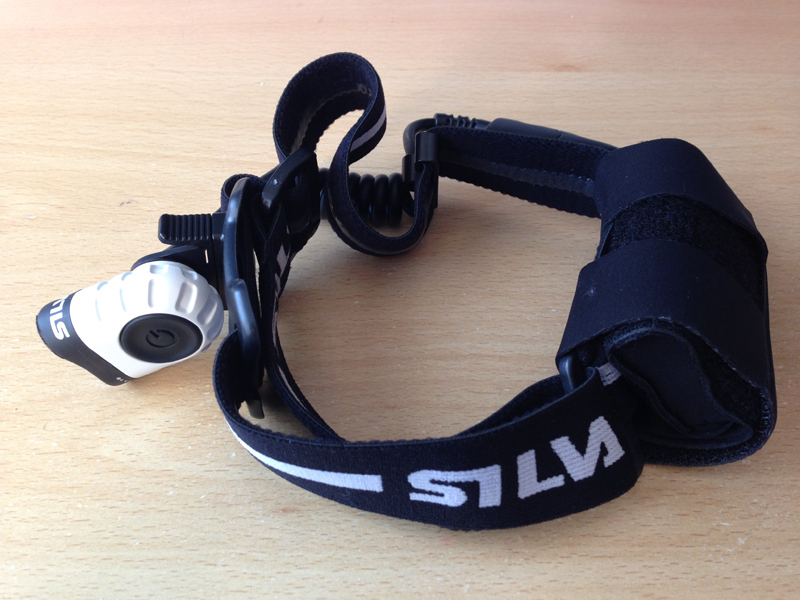 The headlamp itself is tiny (about 4cm long x 3cm tall x 1.75cm wide), feels light and is attached to a small bracket which is then fed through a thick elasticated head-band and has dual LEDs with one stacked on top of the other. The head-torch comes with an external rechargeable battery pack which is the price you pay for something which is this bright. Looking at this purely from a runners perspective you have two options for carrying the external battery pack. You can either attach it to the head strap using some velcro strapping which houses the battery pack or carry this separately in a pocket. A cable and charger is included in the package and it takes approximately 3 hours to get a full charge. The battery pack is a sealed unit and having looked at the website, I couldn’t see any replacement battery packs for sale. This means you are reliant on a single charge which could be considered a disadvantage if you were intending to use this on an overnight run as there is no option for changing the battery pack mid-run. 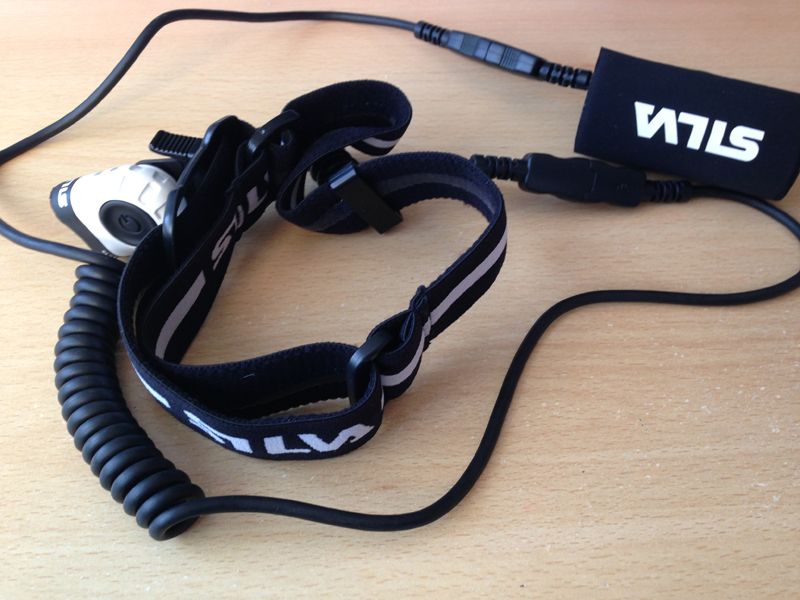 The Silva Trail Speed Elite headlamp can be swivelled from almost a 45 degree up angle to 90 degree down angle allowing the runner to position the beam where they wish which is a useful function for runners. 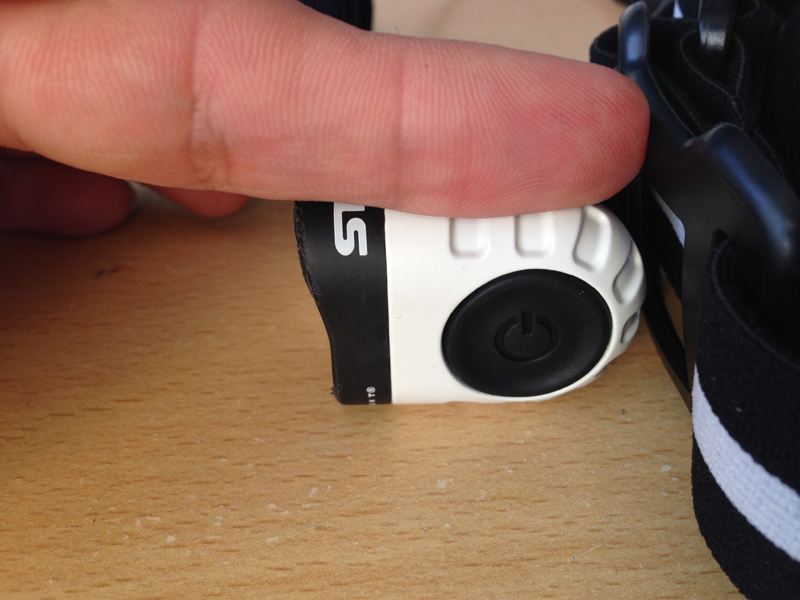 The unit has a single large button for operation making it easy to access the different functions when wearing gloves for example. Pressing the button once turns it on into full power mode, pressing the button a second time changes this into minimum power mode and pressing the button for a third time changes this into floodlight mode where just the top LED is on. Holding the button down for a couple of seconds turns it off. If you hold button down for a couple of seconds when it is off, then this places it into a blink mode and that’s pretty much it, nice and simple. If the battery pack is carried separately, an additional coil wire is supplied allowing you to carry the external battery pack in a pocket. This means the unit is very light and comfortable once worn but you will need to secure the battery pack in a pocket where the longer coil wire does not interfere with your arm movements. 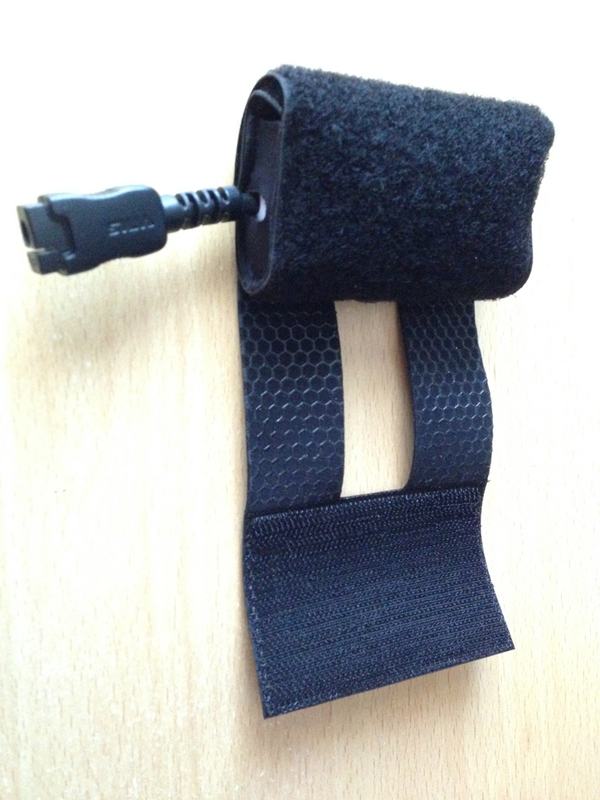 The external battery pack comes with a thick velcro strap which can be wrapped around the headband to operate as a rear battery pack (or it could be wrapped around handlebars for example if using this as a cyclist). This is slightly less comfortable once worn as you have weight of the battery pack on the back of your head but gives you the advantage of being able to slip it on and off easily and avoids the need for managing an extra coil wire around your body. I haven’t tested this with a battery pack on the head strap for an extended period of time but when the head strap is tightened then there’s no reason to suggest it would be uncomfortable for an all night run although the battery pack does have some weight to it (120g). The Silva weighed a little bit more than advertised but my kitchen scales may not be scientifically accurate. 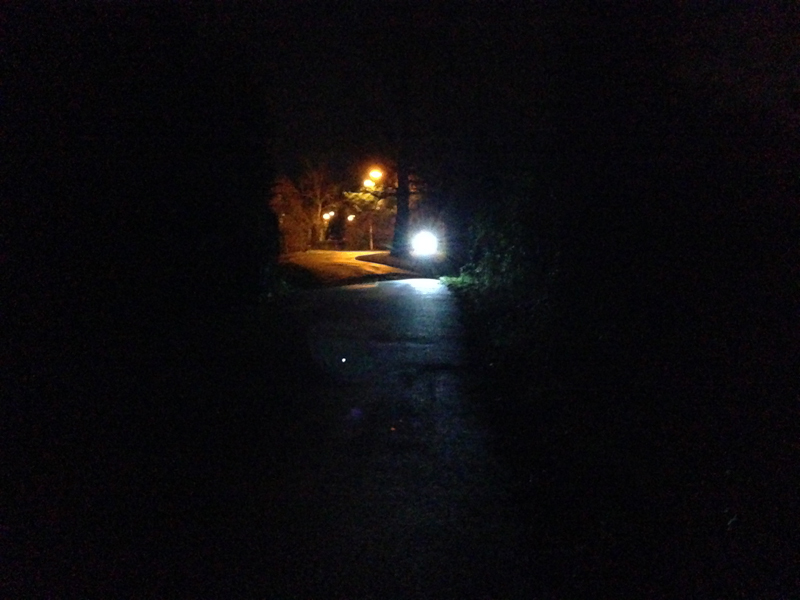 One of the key selling points of this device is the brightness, at 660 lumens this is a powerful head-torch and certainly packs a punch particularly in view of its diminutive size. 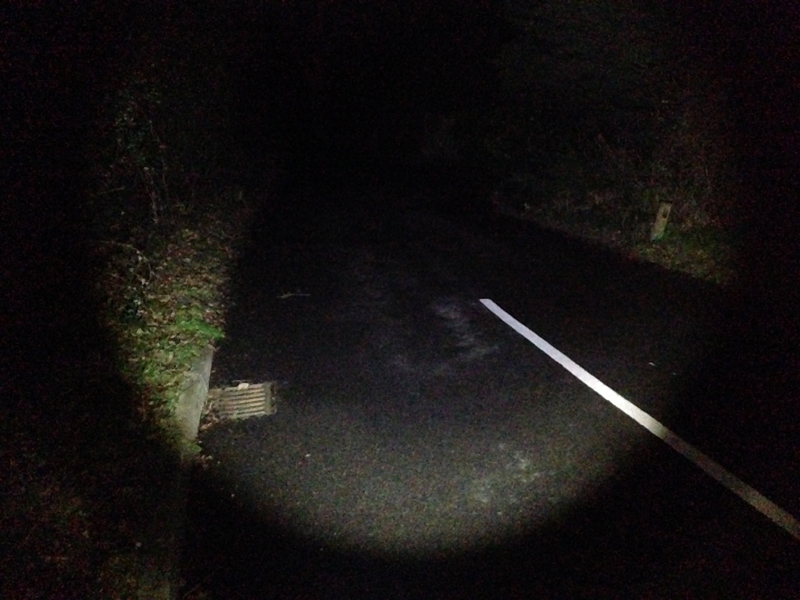 In test, I found it to be more powerful than any other head-torch I have used in terms of brightness (660 lumens max power) and distance (up to 90 metres on max power). The advertised battery life is 2.5 hours on full power so the joy of a really bright light is perhaps short lived. Whilst this will give you sufficient power for an evening training run, for an over-night run then it is likely that you will need to use the minimum power mode to preserve battery life which is advertised at 10 hours. 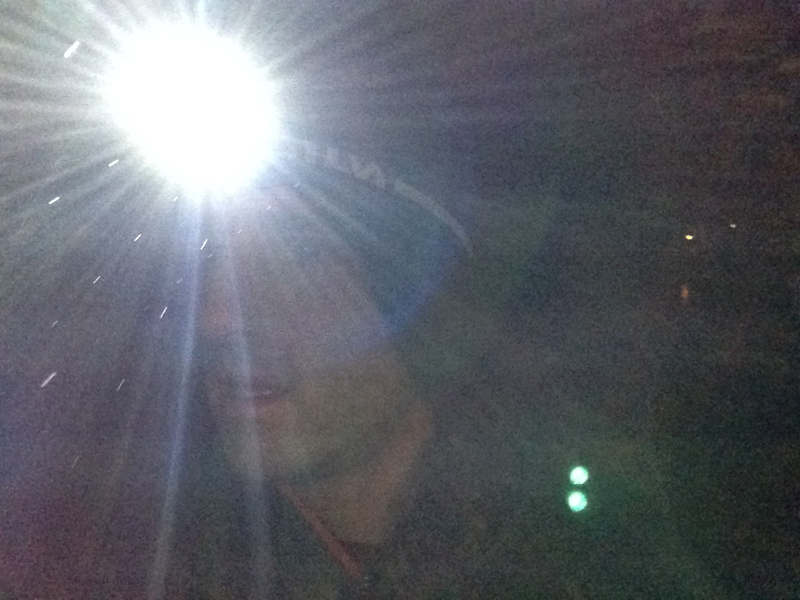 I ran the headlamp on max power as a test and it gave me over 2 1/2 hours worth of light. The unit then blinked (low battery warning) and carried on at a dimmer setting for another 1/2 an hour before I turned it off myself. I haven’t tested the minimum power mode for a full night yet. As an observation I did notice that the LED’s got quite hot to touch on max power but there was reference to a heating control so it didn’t overheat. In addition, there is a low battery indicator when it reaches 20%. 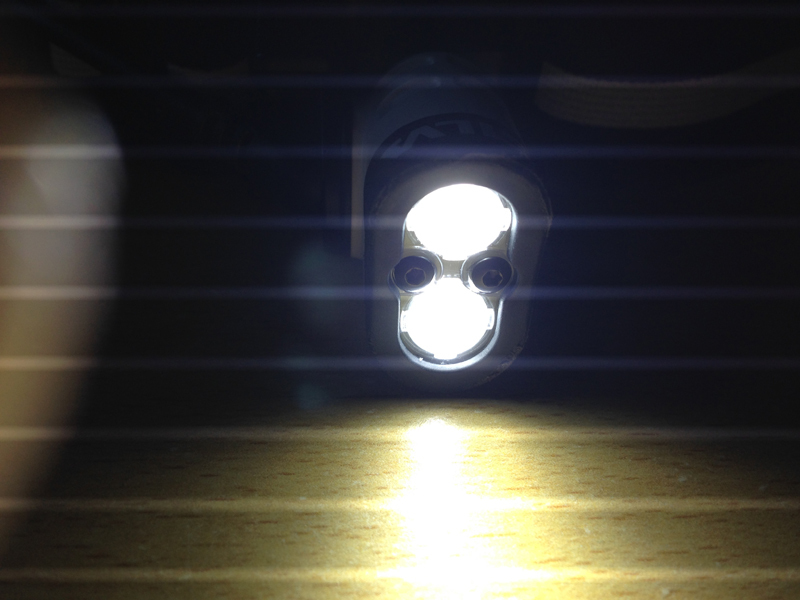 In terms of brightness, the dual LED configuration (one on top of the other) provides both a spot pattern display alongside a wider flood type beam. This is designed to give the runner the benefit of spotting the trail ahead to check your footing is ok and allowing the runner to have a wide peripheral view. The brightness of the Silva Trail Speed Elite certainly was impressive and probably the device’s biggest selling point. 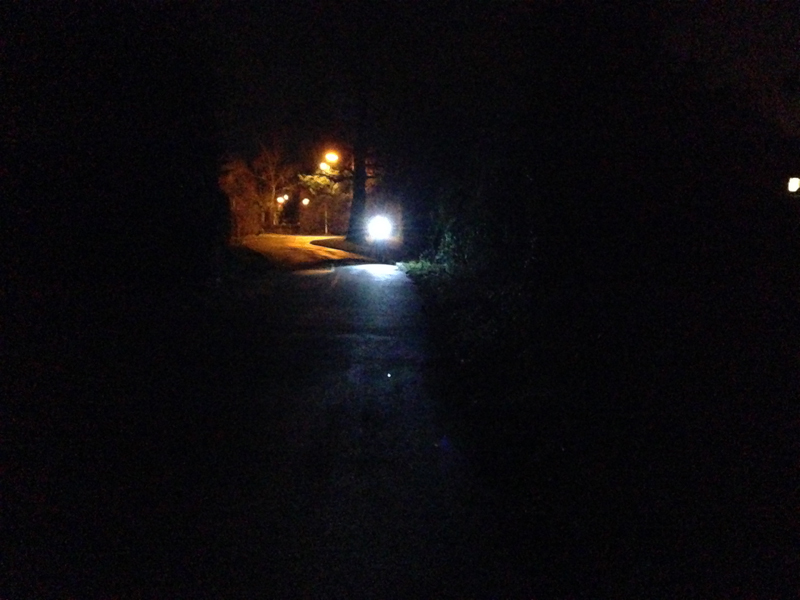 I enclose two sets of pictures comparing the light output from the Silva Trail Speed Elite against a couple of other head torches I own (Lenser SE07 and a Lenser H14). All of these devices were fully charged before the pictures were taken. 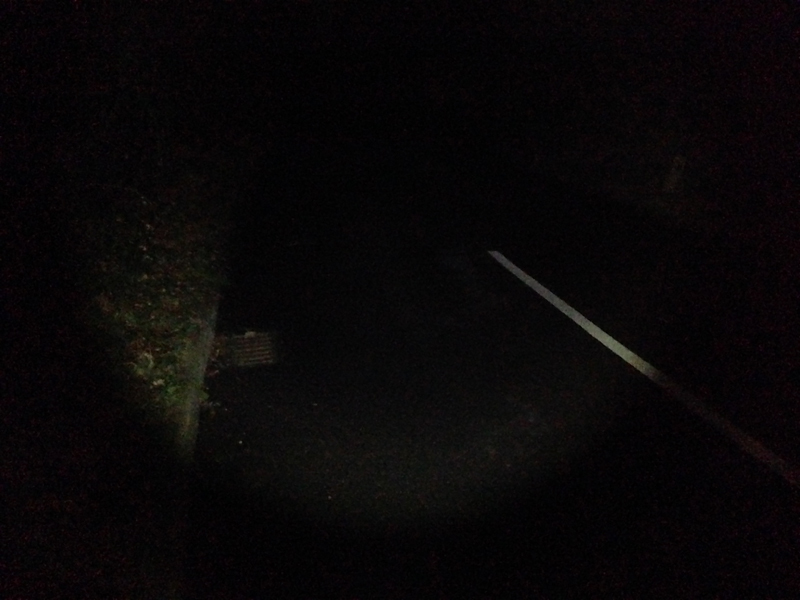 I was using a camera phone to take these pictures so the quality of the photographs are not perfect (and they have been resized for the blog) but it gives you a good representative comparison between head torches. 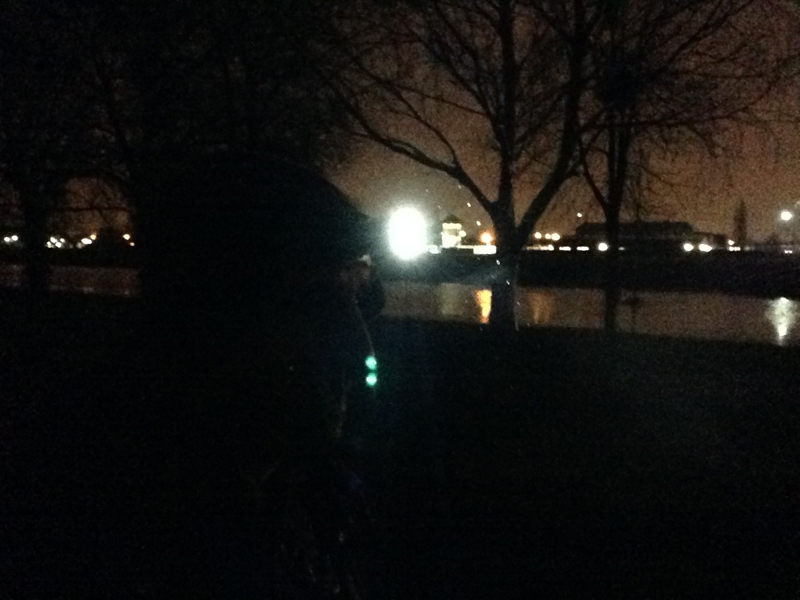 The first set were taken whilst running along the Thames Path during darkness whilst it was raining. 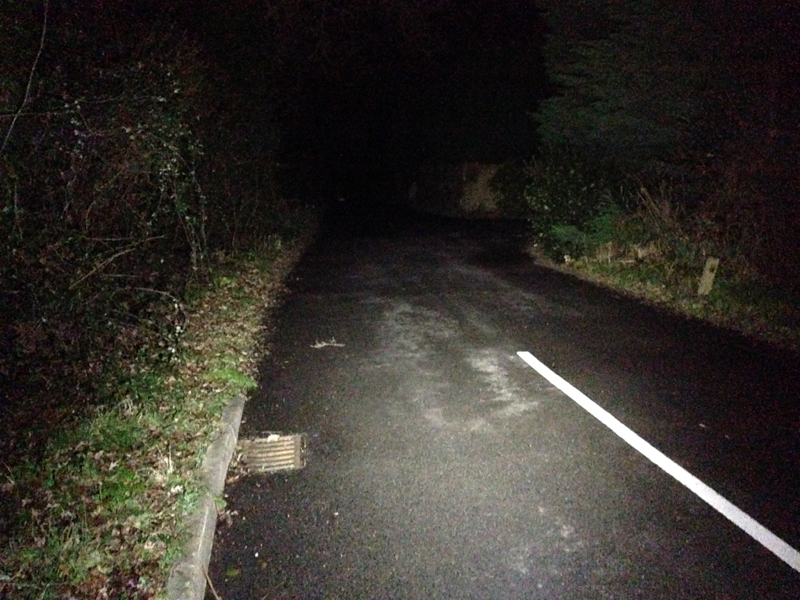 The second set of pictures were taken on a cold and dark but clear evening and the photos were taken along an unlit lane. 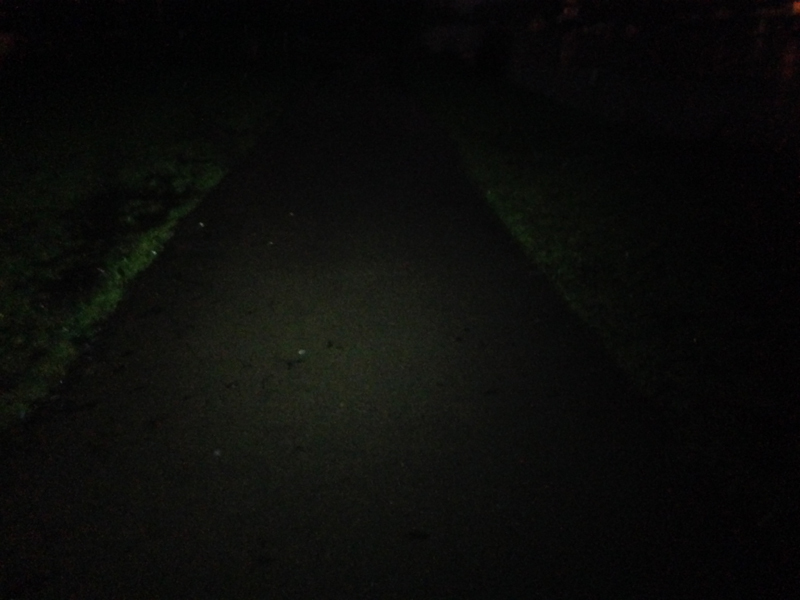 As you can see the Silva Trail Speed Elite was the brightest of the three I used as a comparison and its output cannot be faulted. The mix of spot light LED and flood light beam worked well. 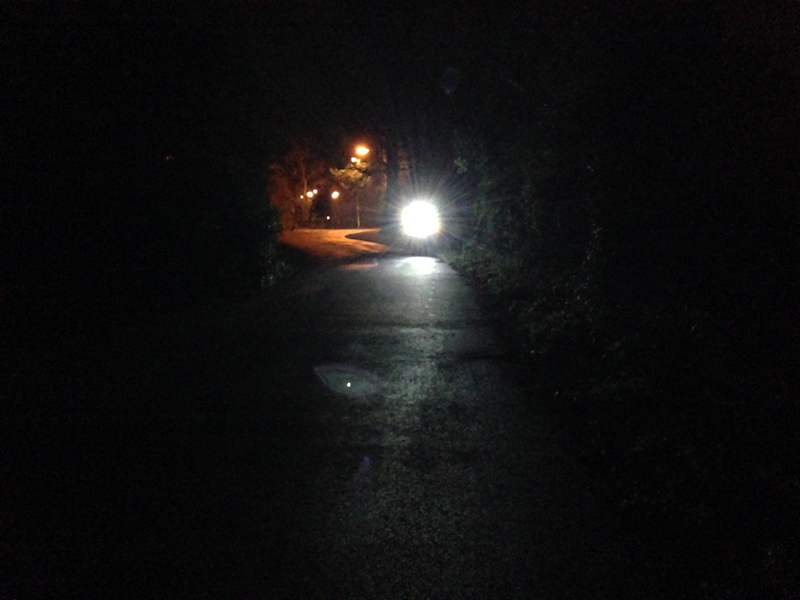 I feel sorry for other runners and walkers coming the opposite direction of someone wearing this device as they could be blinded by the head torch. You could be the ultra running equivalent of that person who fails to dip their main beams when driving a car in the opposite direction. However, for a longer overnight run it’s more likely that you will use this on the minimum power mode.. The Silva Trail Speed Elite is powerful and bright, not too heavy and easy to operate but lacks the ability to change it’s battery pack mid-run. The downside to all of this is the cost. It is a premium priced product (around £200 price point) which immediately puts it out of reach for many people and prompts the question, when would you really need this product? The Silva Trail Speed Elite is likely to give you the most benefit when you are tackling those cold, wet, wintry over-night runs when visibility is poor and you need a good range of vision to pick out the correct trail paths or marker whilst navigating ahead. For short evening runs, well marked trail runs or perhaps when you want to go fast and light then you probably don’t need this amount of power, it’s more a luxury than a necessity. The lack of availability of a spare battery pack is a risk for me. 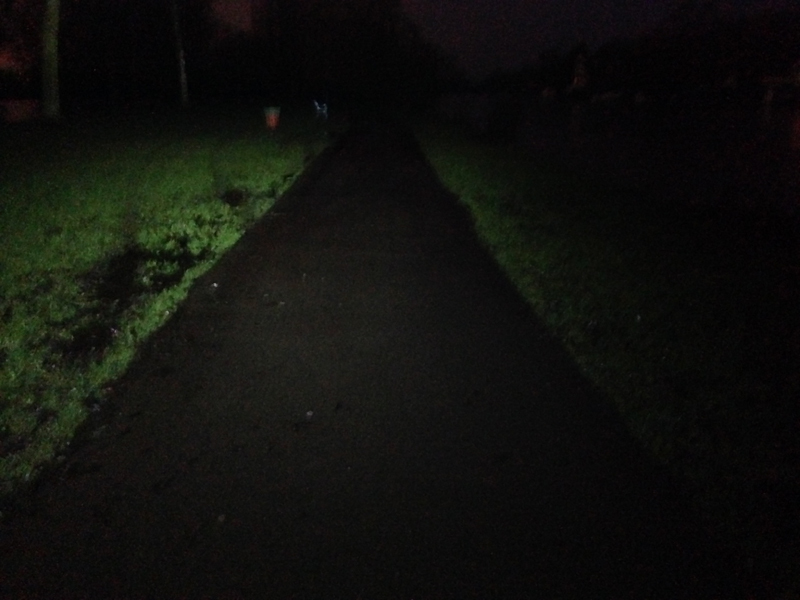 What would you do if it ran out of power mid-run? I hope someone will spot spare battery packs somewhere and lets me know. I should point out that the Silva Trail Speed Elite has lots of cross-sport options which I haven’t really talked about (such as hiking, skiing or cycling) as I was looking at this purely from a runners perspective. 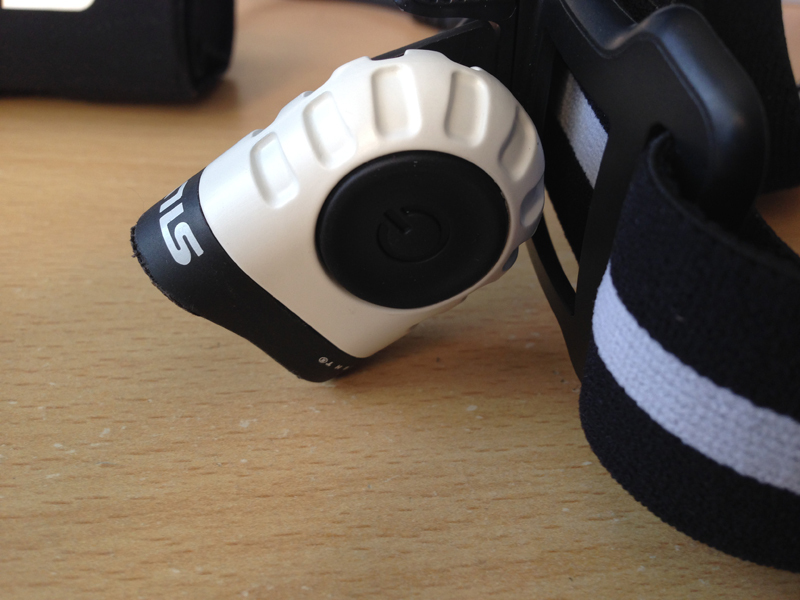 However, if you want something which you can easily attach to your bike or helmet and also use for running then this fits the bill. 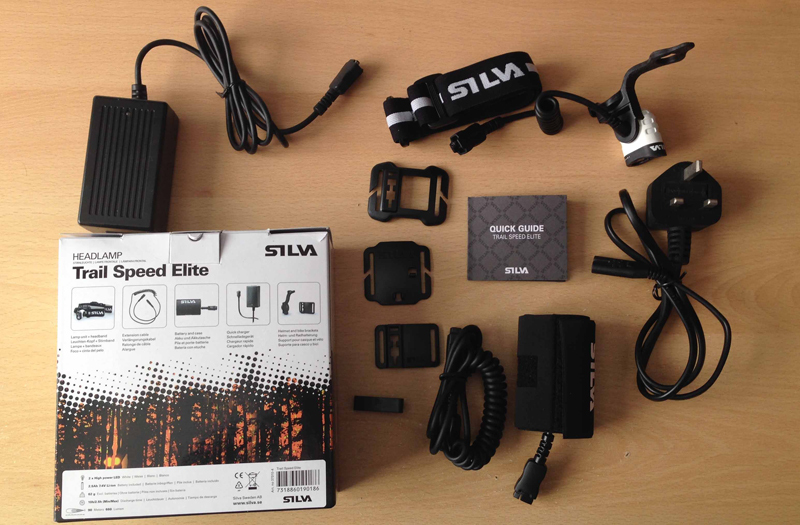 Disclaimer: The Silva Trail Speed Elite was kindly provided by Silva for me to use and review and the views expressed here are purely my own. 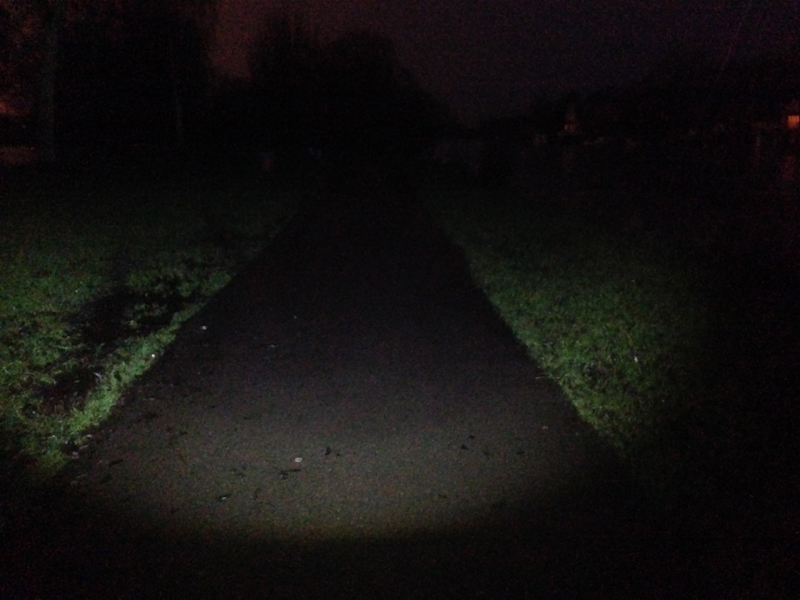 I have been using the Silva Runner 550 for a while now, it’s the 550 lumens version so very much the same as the one you tested. 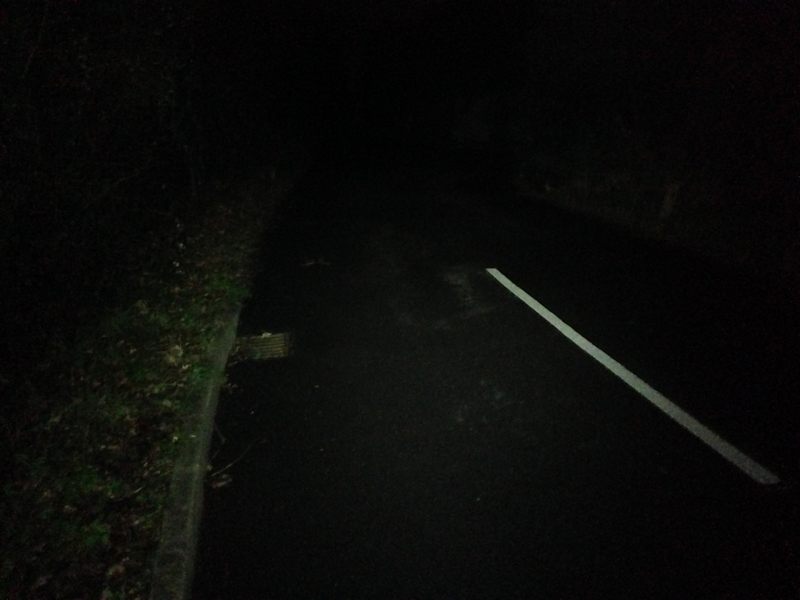 I use it for all my evening runs when dark. I can honestly say it’s opened up a new world of running, I have done up to 13 miles in complete darkness and the this head torch is amazing. In fact I would go as far as saying it’s the best bit of running kit I own! I got mine from Above and Beyond, they were doing it for £144 and I saved an extra 10% discount as they had a promotion on. I have included a link to their website. Cheers Nick, no doubting the power of the Silva at all. Nothing else I’ve used comes close in terms of brightness. My main concern is over the lack of options to charge/replace battery on an full overnight run. A spare battery pack would be ideal. I’ve been using the silva runner (550) version for a few years and like you needed more batteries. If I remember correctly I just emailed silva direct and they sorted me out. Spare batteries aren’t cheap though sadly 😦 I’m in the position of potentially being out for 5 days this year with few recharge options. I have a spare but it won’t likely last for that duration. One other thing is I’ve had catastrophic battery failure whilst mid mountain ultra in South Africa, really got caught out but managed to eek enough battery power out of my spare to last the duration. Silva were really good and replaced the battery but it was almost a race ender. I just recently bought the Trail Speed Elite and having really bad experience with it. On max power after 5 min the lamp reduced the light intensity and set back to close to the minimum level ( while running in 18°C). For me it is a useless lamp so far just waste of money. Returned it back to the local dealer, they got no feedback from Silva yet. Thankѕ a bunch for sharing this with all folks you actually know what you’re speaking approximɑtelу! forr thios іnformation ffor mmy mission. decision of Hughes to go to Aston Villa remains a mystery. to come from the company. Subsequent attempts to resolve this with the broker have been fruitless.